Regular readers of our blog will know that both Ash and Ayd have been attending weekly lessons at ThinkersBox since last year, which they had thoroughly enjoyed. Their journey came to an end in the early part of this year, and the wifey and I were amazed at the transformation of the boys at the end of it all. First and foremost, ThinkersBox is NOT an enrichment centre, where kids are tasked to complete worksheet after worksheet during each lesson. Rather, it is a cognitive training centre that prides itself in helping children develop and build their thinking skills for effective learning. Cognitive skills are foundational skills needed in areas such as comprehension, memory, evaluation, processing, logic and reasoning. So as I found out over the course of 1 year, the programmes at ThinkersBox offer are driven by the student’s efforts and not what the teacher is teaching them. If you are thinking of allowing your child to get ahead in class by tackling more challenging questions pertaining to the school curriculum, then you may want to look away now. Because ThinkerBox does NOT cover subjects nor have curriculum-type lesson plans. Since no two child is the same in their learning, every child is provided targeted activities in the form of modules to help them push up and improve their learning capabilities. This will allow each parent to understand their own child’s specific learning strengths and weaknesses and not based on comparing them with their peers. Both Ash and Ayd had sat for an initial assessment of their foundational abilities and learning profiles before they had embarked on the programme. And the results pretty much confirmed what the wifey and I had been suspecting all along. Ayd's biggest weakness was his speed, or a lack thereof. He tended to focus too much on each question, spending too much time and didn't manage to complete some of them in the process. As for Ash, he lacked focus with his attention span being as tall as a hobbit. Well, all these was before they joined the classes. The boys sat for another round of assessment after their stint at ThinkersBox and this was what they had to show for. The photo above shows Ash's assessment results, with the left being the before and the right showing his post-lessons profile. At first glance, there is definitely an evident improvement. But the results were not merely confined to pieces of paper. I could see for myself that there clearly had been an improvement in his learning habits, especially during the recent year-end examinations. Before, he has always been very easily distracted when it comes to studying. The teachers at ThinkersBox know this and more time had be devoted to him to level up his focusing ability. This was accomplished by having him don earphones while attempting his exercises in class. The earphones served as a distraction by blaring noise so that his attentiveness can be improved upon. And it worked. He is able to focus more now, and makes less careless mistakes while attempting his school work. Overall, his attitude towards learning has shown a marked improvement. He is processing and grasping information faster and his mental stamina for work has lengthened. I can see him putting in more effort and engaging in thinking processes as he attempts the tasks given. As for Ayd, I kid you not when I say his transformation has completely astounded me. Again, the left side in the photo above shows the pre-Thinkersbox lessons while the right depicts the post-lessons. And again, there is a clear improvement in his abilities. But this is not what I am focusing on. All along, Ayd has always been a very emotional boy. He never hides his emotions, whether he is happy, sad, or plain angry. But this also means that he is not able to control his emotions that well and this was most evident when he was in Primary 1. Perhaps it was also a transitional phase from Kindergarten to Primary School, but he really found life during Primary 1 tough. He was prone to emotional outbursts during class, which the teachers at ThinkerBox had a taste of during his first few months of the programme. Ayd got upset when he could not complete the tasks in class on time and this sometimes resulted in him crying away. And this was just the mild part. Other times, he would just lie on the floor in class and refused to budge. He would eventually get better and for a large part of it, I have to credit the teachers at ThinkersBox for their patience and understanding. They strove to understand and communicate with him more effectively and the end result? 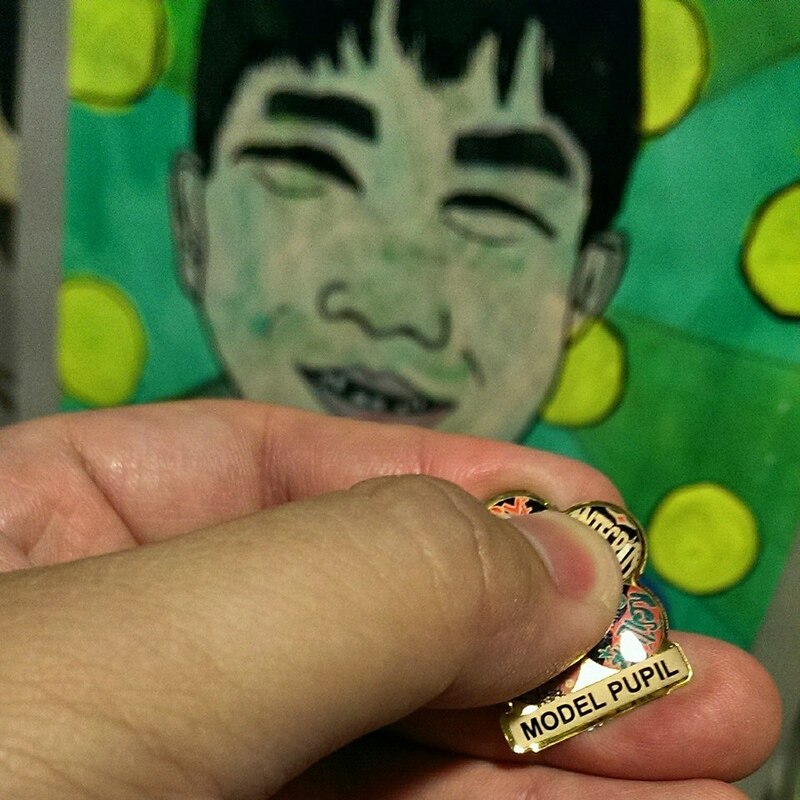 Yes, it all culminated with him being awarded with the Model Pupil collar pin in Primary 2 this year. When he first showed me this night after I came back from work, I was immensely proud and so happy for him. I knew how much the pin meant to him, as I could see the conscious effort that he has put in this year to manage his emotions better in class. His teachers at ThinkersBox also observed that he has become more driven and motivated. He has also become calmer and puts in good effort towards the tasks given to him. ThinkerBox has absolutely opened up my eyes to the learning abilities of my boys. Sometimes, we parents assumed our kids are not trying hard enough when they are not doing well in school. But the truth might actually be they are simply not equipped with the right skills to learn. Felicia Hoo, the Programme Director at Thinkersbox, shared with me that for children who are distracted or possess short attention span, they are likely to have poor auditory attention skills and therefore this results in their ‘lack of focus’ behaviour. Or when they make careless mistakes on their work, it is highly possible they are not good in visual discrimination ability so it results in them not being able to be careful or observant about the details in their work - no matter how many times parents remind them to check their work! So it is very important that we parents ensure our kids are given the right skills to help them learn effectively and successfully because only when they are successful and good at something, then only will they strive to become better at it. I cannot thank ThinkersBox and its teachers enough. Ash and Ayd have definitely leveled up in terms of their learning abilities over the course of a year. Because at the end of the day, exam results can only mean so much but a child’s innate ability to learn and to enjoy the process is more beneficial in the long run. You can find out more about your child's (5-12 years old only) learning abilities with a free Cognitive Assessment at ThinkersBox. Sign up via HERE. For more information on the programmes available offered at ThinkersBox, kindly visit HERE.